Please visit my projects page for a more thorough (but less discriminating) list of projects. Here's a list of my Twitter bots and my Github profile. My home page has a list of ways to get in touch with me and a current bio. The poems in Articulations are the output of a computer program that extracts linguistic features from over two million lines of public domain poetry, then traces fluid paths between the lines based on their phonetic and syntactic similarities. The book, published in January 2018 by Counterpath Press, is the culmination of an extended period of research in machine learning and phonetic similarity, which also resulted in a paper published in the Experimental AI in Games Workshop in 2017. The source code for some of the techniques used to generate the book are available on GitHub. I gave a talk at Strange Loop 2017 about this project, which includes a short reading of an excerpt from the book. A Gutenberg Poetry Corpus is a collection of three million lines of poetry collected from hundreds of public domain books in Project Gutenberg, along with source code for making your own custom version. The corpus, supplied as a compressed sequence of JSON objects, is especially suited to applications in creative computational poetic text generation. 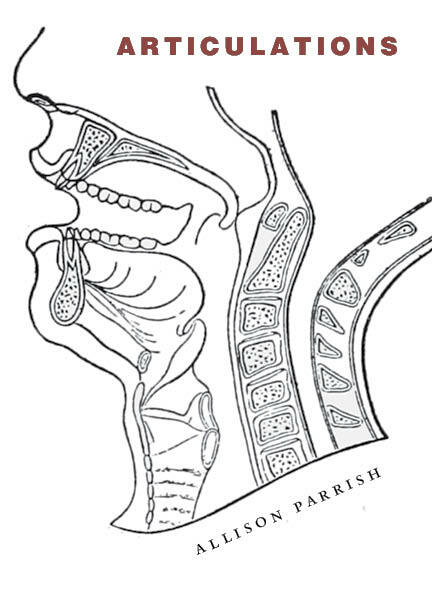 A previous version of this corpus was used as the basis of Articulations. The corpus itself is based on Gutenberg, Dammit, a corpus (along with source code) I made of every plaintext file in Project Gutenberg (up to June 2016), with consistent text encodings and metadata. Here are the slides for a presentation I gave about both projects at ELO 2018. 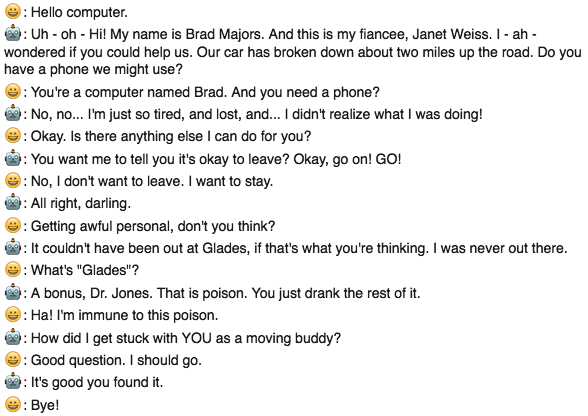 I teach programming, arts and design and a perennial project idea is to make a chatbot that mimics someone or something—a famous author, a historical figure, or even the student's own e-mails or messaging logs. So I made a simple library and tutorial for creating a "chatbot"–based on semantic similarity among lines in source corpus–in order to give those students some sample code to work with and a bit of a head start on concepts and architecture. There's a Google Colab notebook version you can use in your browser without having to download anything. Janelle Shane had some fun with it! In collaboration with Adam Simon and Tim Szetela. Rewordable is a card game played with a deck of commonly occurring letter combinations in the English language. 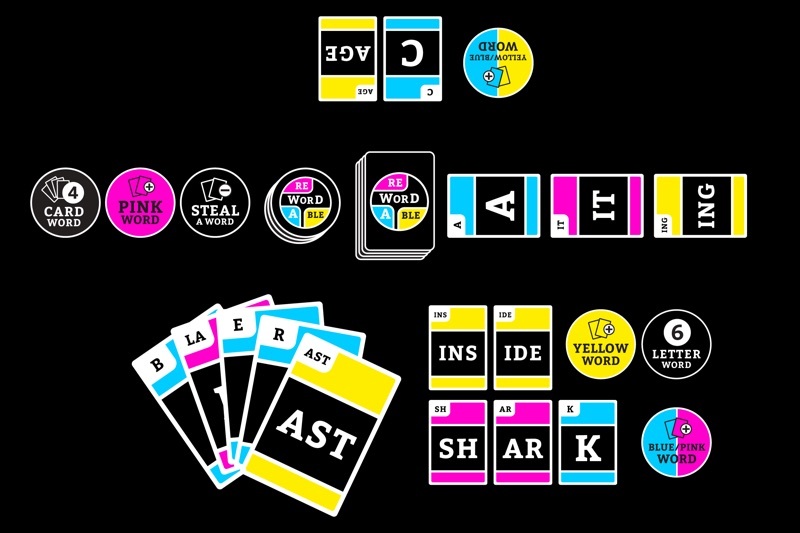 Players arrange these cards to form words of increasing length and complexity, drawing from their own hand or by stealing cards from other players, building onto already constructed words. Rewordable is the result of a computer-aided game design process, using both computational analysis and extensive in-person playtesting. I wrote about the computational design process in a post on Medium. Rewordable was funded on Kickstarter in late 2016, reaching over two hundred percent of its goal, and was published by Clarkson Potter (an imprint of Penguin Random House) in August, 2017. Buy a copy today at your local bookstore or through your favorite online retailer. Word embeddings are numerical representations of word meanings in a continuous high-dimensional space. Over the course of 2016, I presented and performed poetry produced through signal processing procedures applied to word embeddings, manipulated expressively in real-time. This research was first supported during a research residence at DBRS Innovation Lab, which resulted in a demo app and a comprehensive write-up by Lab staff members. I gave a talk at Alt-AI on some of the relevant techniques and my 2016 ! !Con talk also touched on my research in this area. With the latest version of the live interface, I performed live creative text synthesis at We Have Always Been Digital, a performance event presented by the Electronic Literature Organization at the Kitchen (curated by Illya Szilak). 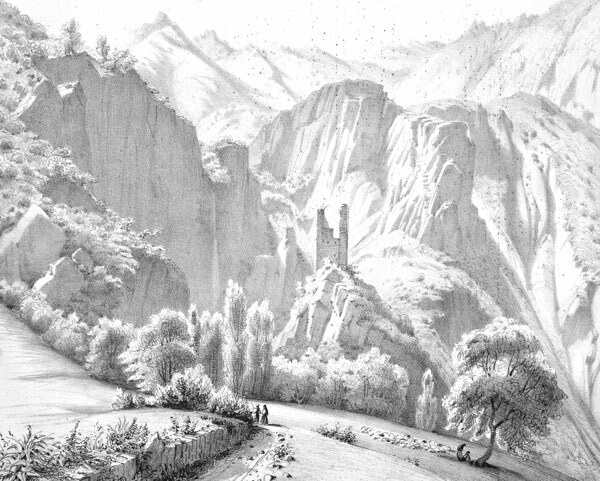 Our Arrival is a procedurally generated novel by Allison Parrish that recounts the daily events of an expedition through fantastical places that do not exist. The novel’s primary source text is a database of over 5700 sentences drawn from a curated subset of the Project Gutenberg corpus. 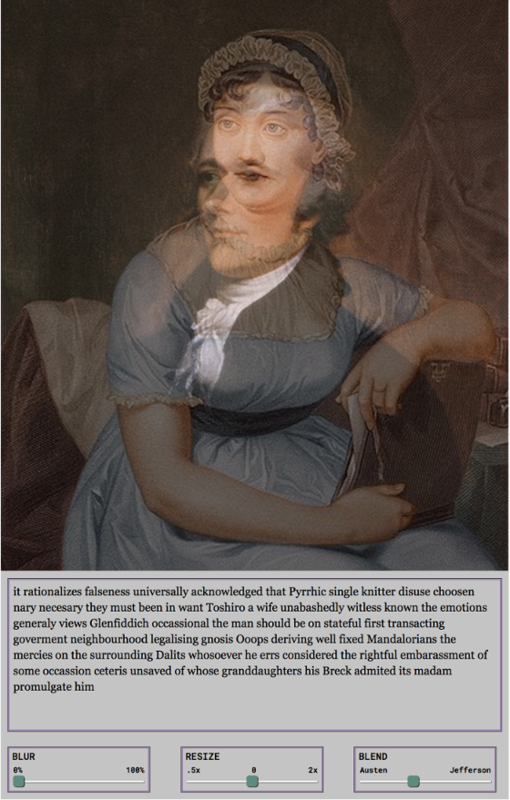 Each sentence was selected based on semantic and syntactic criteria, namely: the sentence must not have any nouns that refer to human beings; the sentence must have as its subject some kind of natural object or phenomena; the sentence must not have a pronoun as its subject; and the sentence must be in the past tense. The resulting list of sentences appear to be assertions about the natural world. 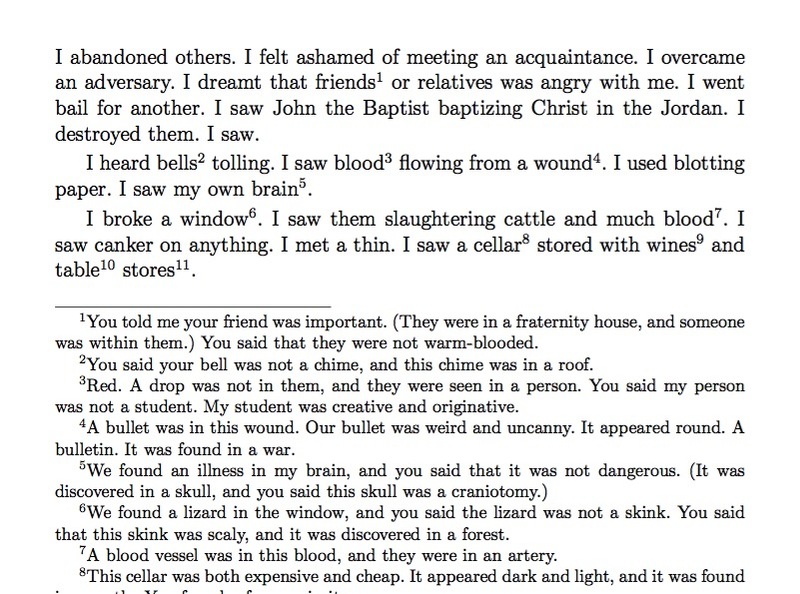 A number of different procedures produce the sentences that comprise the text, including automated grammatical constituent swapping (subject noun phrases are switched out between two random sentences), random topic elaboration (sentences using a pronoun to refer back to and elaborate on the subject of a previous sentence) and random grammar-generated expressions of awareness and affect on the part of the novel's two main characters (I and you). The novel was featured in chapbook form at AND Festival's 2016 Art of Bots exhibit, and excerpts, interleaved with an expository essay, were published in Ninth Letter. Our Arrival was also included in "SAFE", an online exhibition curated by Christpher Clary. 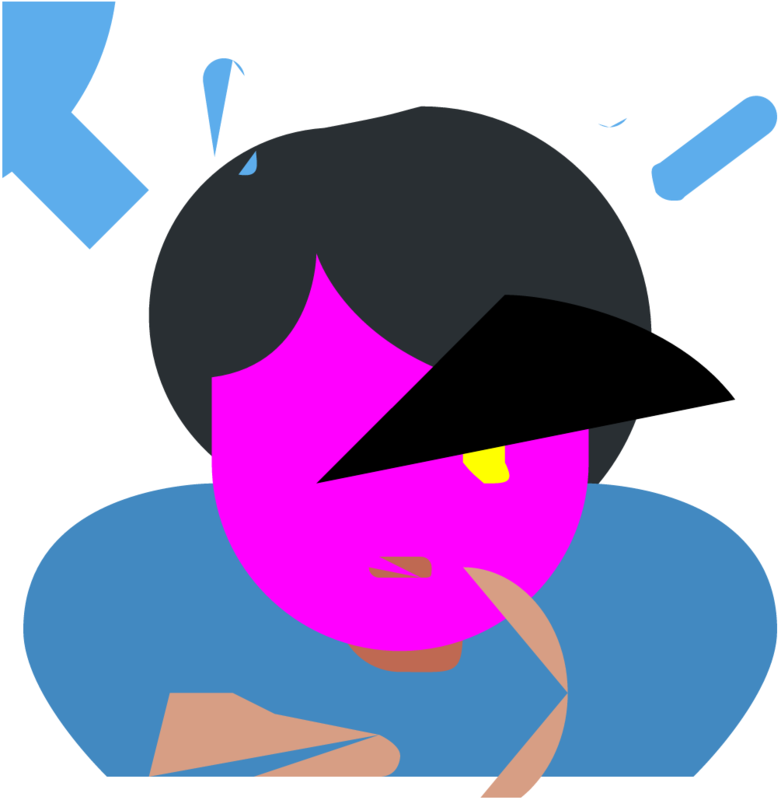 smiling face withface is a Tumblr bot I made that generates and posts glitchy versions of emoji, based on the open-source SVG files released as part of Twitter’s twemoji project. A Python program selects an emoji SVG file at random, adjusts the markup and numbers in the SVG file, and (optionally) recombines the paths in the selected SVG with paths from other emoji SVG files. The results are posted to Tumblr. I wrote more here about my motivations for making the bot. Featured in physical form at AND Festival's "Art of Bots" (great photo of the print here). The Ephemerides is a Twitter and Tumblr bot that takes a randomly selected image from NASA’s OPUS database—a repository of data from outer planet probes like Voyager, Cassini and Galileo—and posts it to Twitter, accompanied by a computer-generated poem. The idea behind the bot was to address the similarity between space probes and generative poetry procedures and ask what would poetry written by a space probe look like? 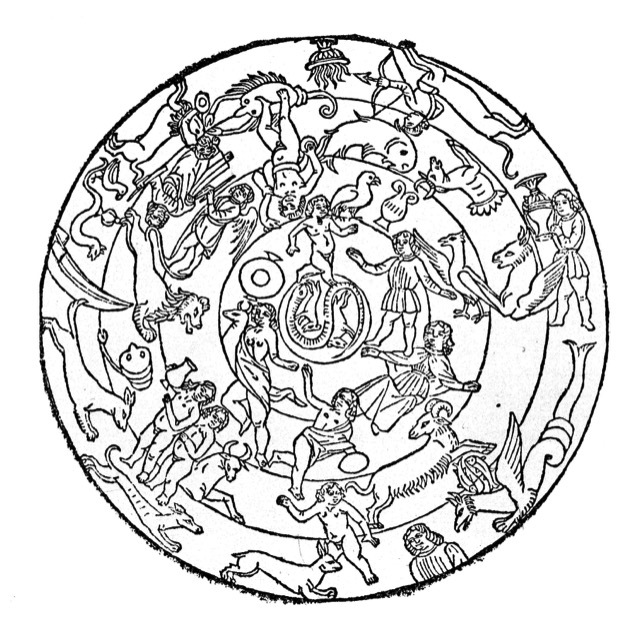 The text of the bot comes from two sources: Astrology by Sepharial and The Ocean And Its Wonders by R. M. Ballantyne, both available from Project Gutenberg. The first text contains references to the planets and their movements, and how those movements can be interpreted; the second text is about the open sea, water, ice and lengthy, often one-way voyages into the unknown. The Ephemerides was the topic of an interview I did with Lenny Letter in October 2016. 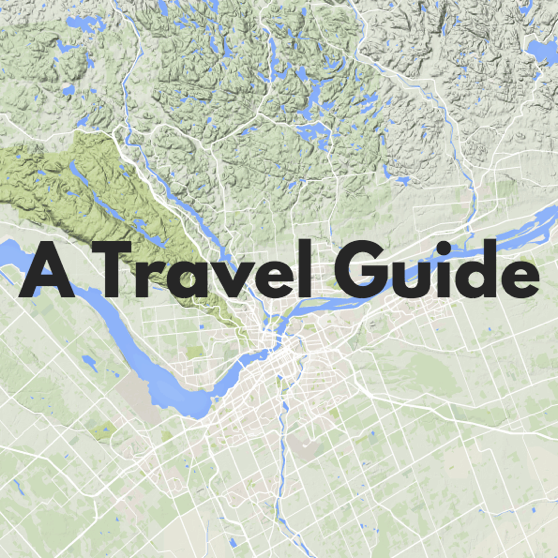 A Travel Guide is a web-based, location-based, mobile-centric application for randomly creating short, poetic texts in the style of the travel guide. A Travel Guide has as its goal to give its visitors an alternate reading of place, through the serendipitous juxtaposition of their current location with evocative procedural text. The guides, of course, are not traditionally "accurate." You may need to try harder than usual to apply the information contained in these guides to the locations in question. A Travel Guide is a 2014 commission of New Radio and Performing Arts, Inc. for its Turbulence.org website, and was a featured work in the Electronic Literature Organization's 2016 Festival Exhibit. Made in collaboration with Rob Dubbin, International Jetpack Conference is a retro adventure game, created for MS-DOS (with ZZT, the once-popular game creation software). The game made an appearance on PC Gamer and was an Honorable Mention for IGF 2015's Nuovo Award. 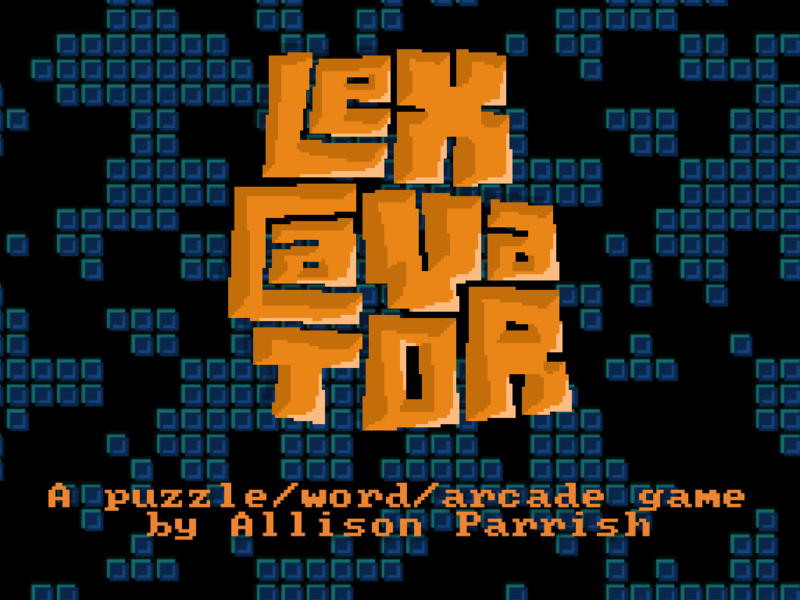 Lexcavator is a retro-styled arcade/word game for Mac/PC/Linux that combines platformer controls with word game puzzles. The goal is to advance your character (@) deeper and deeper into a well of letters by clearing words from the board. There are several game modes: in Arcade Mode, the screen scrolls up automatically, and you need to descend quickly to keep the pace; the scrolling speed increases gradually as you progress. In Time Trial mode, you have a set amount of time to descend as deep as possible. Quest Mode pits you against dozens of puzzle-like challenges (e.g., find three seven letter words in a row). The game keeps detailed records of your play, including a list of the best words you've made across all modes. A minimal, anonymous global leaderboard shows players how their scores stack up, and alerts them when they've found a word no one else has found before. Programmed with Processing.py. I also wrote the soundtrack, which is available on Bandcamp! The Autonomous Parapoetic Device is a self-contained and portable machine that generates poetry. Constantly creating new sequences of words, lines, and stanzas, the APxD promises serendipitous encounters between aleatoric (but affective) text and our experience of physical space. The text that the device generates is ephemeral: it remains on screen for only a small time, and then is replaced with a new (although algorithmically similar) text. No two interactions with the APxD are the same, leading to an endless variety of possible interpretations (is it descriptive? oracular? nonsensical?). 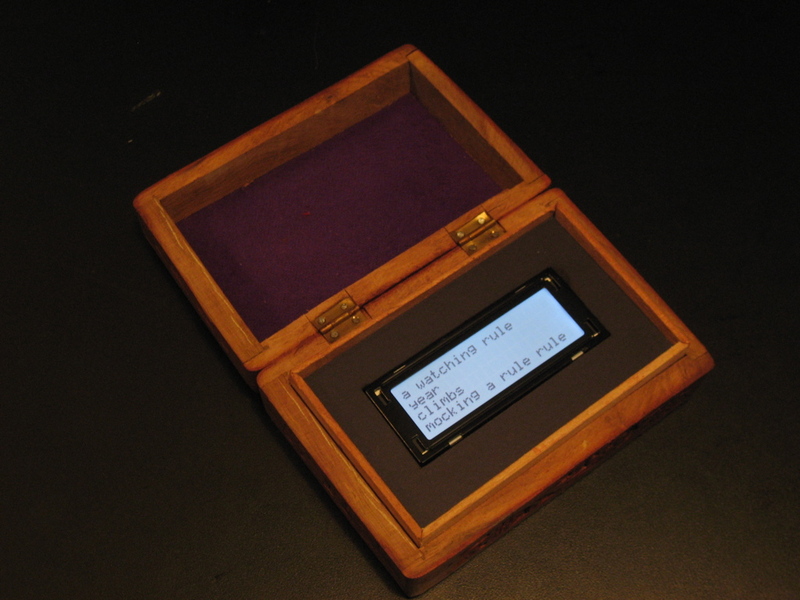 The device consists of an Atmel microcontroller connected to a 20×4 LCD screen, and runs for hours on two AA batteries. Conveniently packaged for use in the home or on the road. Featured in Codings at the Pace Digital Gallery (curated by Nick Montfort) and in Neural Magazine. New Interfaces for Textual Expression is a series of devices intended to create and manipulate text. Analogous to contemporary work in the field of New Interfaces for Musical Expression (NIME), New Interfaces for Textual Expression are intuitive but not literal: they map gestures not to characters (as with conventional writing devices, such as the keyboard and the pen), but to broader manipulations of language and layout. 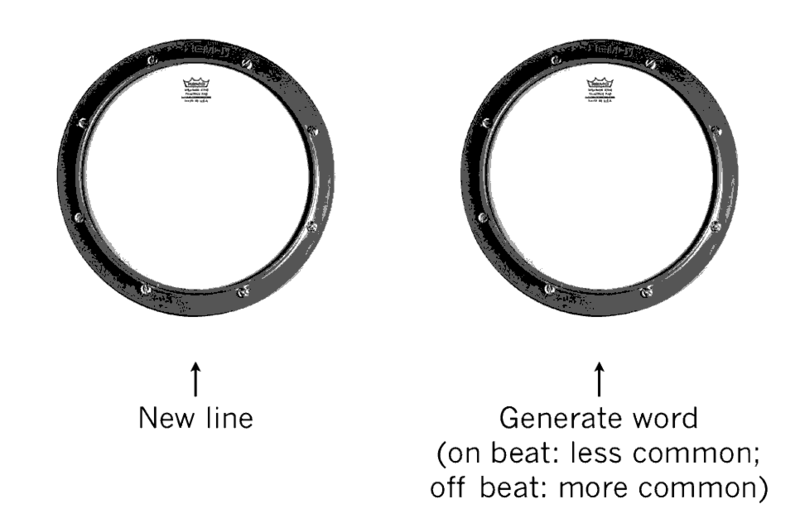 The devices suggest new syntaxes for composing, reading, and performing text. Originally consisting of my thesis paper and project at ITP, New Interfaces for Textual Expression continues to be a research methodology for me and an avenue for producing new creative work. Read my thesis paper here. 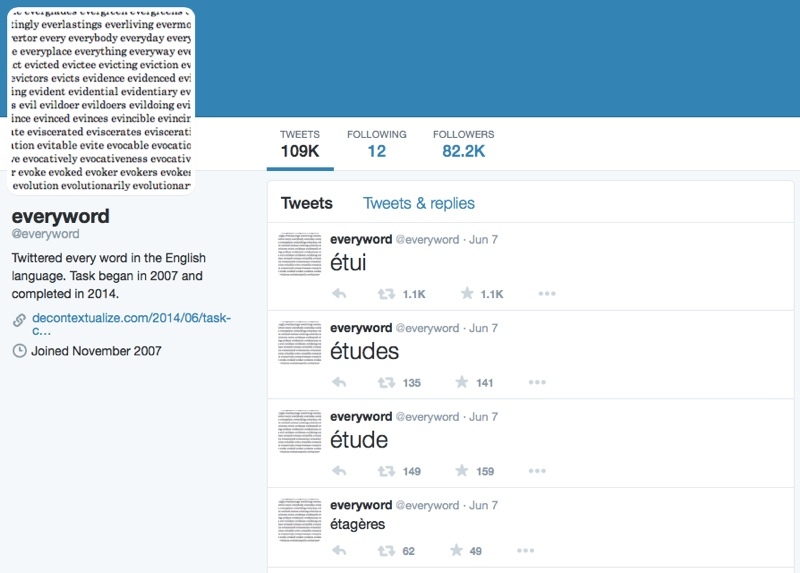 @everyword is a Twitter bot that I made in late 2007. Its mission was to tweet every word in the English language, in alphabetical order, one word at a time, every thirty minutes. It completed its task in early June 2014. Along the way, it gathered over one hundred thousand followers. Featured in Gawker, the Washington Post, the Paris Review, and more. A collection of the bot's tweets, along with an introduction explaining my process and motivations, is available from Instar Books.